You asked for it! I've been carefully sourcing my ingredients and testing my spice blend recipes. I'm planning on debuting at least least three blends by the end of December 2007 or mid January 2008. I chose the date because there will probably be a very nice selection of my recipes in a national food magazine at about the same time. My spice blends will be available in stores around the country, to the wholesale trade and via online. I've been talking to buyers from gourmet chains, as well as "ethnic" stores. As regular readers of my blog know I take a cross-cultural approach to not only teaching, but with publicity as well. If you'd like to placed on a pre-order waitlist, please email me with the subject header "Spice Blends". I received a question via email regarding Algerian mustard sauce and why Algerians add prepared mustard like Maille to salad dressings. We have a traditional mustard sauce based on ground mustard and verjuice or vinegar. I know that it goes back to Moorish Andalusia, possibly older than that. Refer to mustard (sinab). "Mustard: Sinab was simply mustard as we know it, ground mustard seed made into a condiment with grape juice or vinegar; it was common in Andalusian cooking but not known in the Levant, where mustard was always a spice, never a condiment." I don't know if mixing mustard sauce into salad dressings is a French influence. Industrially prepared mustard sauces such as Maille are obviously a French influence in Algeria. So, we had an older simpler homemade mustard sauce and easily accepted a more convenient, ready made substitute in the form of Maille. And, non we don't have Grey Poupon. In a review I wrote about North African recipes I mentioned that we have a very small variety of lemon. I noted that a Moroccan recipe calling for several preserved lemons in a recipe could be referring to these small lemons. Thanks to food blogger Emily at What's For Lunch? I have a photo to show you. The small lemons look like they are about 1/4- 1/5 the size of the large ones. When I first started this blog a reader asked me about preserving limes like lemons in the North African manner. At the time I was not aware that we make preserved limes. I knew about preserved oranges, but the limes I had not seen before. Since then I've learned that we do indeed make preserved limes in Algeria and they are used much the same way as preserved lemons or oranges in savory dishes. We also make sweet and salty or just sweet citrus preserves. I used this this jar for the sake of taking the photo. I'm going to transfer it to a jar with a plastic lid. You don't want to use anything with metal because it will corrode. There's really nothing to do making these, I sprinkled 1/4 cup of coarse sea salt over every 1-2 layers of limes. You'll notice that I usually cut my citrus in half or quarters, whereas lots of other recipes call for making incisions into the citrus. I prefer my method because I rarely use a whole citrus in my recipes. Top with water. I find the suggestion to top with citrus juice to be a bit of overkill. Salt preserved citrus has quite a bit of flavor, there's really no need to add more. During the winter don't forget to make preserves with small sweet lemons and blood oranges! I'm finding some great bargains on slightly soft tomatoes, less than 50 cents per pound for vine ripened tomatoes that are getting late in the season. They're not exactly overripe just a little too soft for salads. They are perfect for making fresh salsas and tomato sauces. I grated 2 pounds of tomatoes on the side of a box grater and discarded the skin. I didn't strain out the seeds, you can if they bother you. I cooked 1 pound of chick peas that I had soaked overnight in water for about 2 hours, drained and added my fresh tomato puree. And cooked the chick peas in the tomato sauce seasoned with salt for another 30 minutes. I wanted very tender cooked chick peas and a simple base to make other dishes from. I made a big batch for freezing. I portioned the chick peas into small sandwich bags, wrapped the bags in parchment paper to keep them from freezing together and tossed them in a large zipper lock bag. Merquez are Algerian and Tunisian sausages made with lamb. Merguez are not "Moroccan sausages". 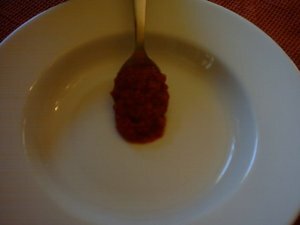 While I'm at it, I'll add that harissa is also Algerian and Tunisian. Packaged "Moroccan harissa" as a "traditional Moroccan sauce" is a marketing invention. Merguez sausage and harissa entered tourist areas in Morocco to meet foreign demand. One of my sources for this information is my Moroccan friend Rachid of The Centre National de la Recherche Scientifique (National Center for Scientific Research). We had an interesting discussion about how merguez and harissa became increasingly common in tourist areas in Morocco during the past several decades. Cook's note: the quality and intensity of spices on the market can vary considerably. Add one tablespoon and cook a little patty of meat to taste it. If it isn't spicy enough for you add more spice blend. This is the color merguez spice blend should have. So, about that book that so many of you have been asking about. A book deal is pending. If you want to test recipes for the book email me at bookofrai AT yahoo DOT com. I'll let you know more details later. Maybe I'll write posts about the whole process, since I know quite a few readers of my websites aspire to be published food writers. Update- Thanks to everyone who responded. I was a bit slow about responding to everyone individually. I would also love to hear from people who've already tried the recipes that I've posted on my websites. I did find a few bloggers here and there who posted about trying my recipes if you can send me links I'd appreciate it. The book deal is actually for a series of books. The first one is about Algerian Cuisine in general, the second about Algerian breads, pastries, preserves and sweets and finally Algerian charcuterie and offal dishes (the whole lamb and cow from head to tail or the whole bird from beak to tail feather). After that I will begin work on a French regional series. There's more but it looks like my schedule is pretty packed for the next 10-15 years already. I'm also looking for test readers. A more general audience type reader. Readers who are new to Algerian cuisine, but maybe familiar with other Mediterranean cuisines. These are some of the ingredients I cooked with today. I bought them at a local Middle Eastern market. The prices are very good. Sometimes I get a great deal, other times I'm reminded "you get what you pay for". The store occasionally carries produce from smaller farmers. I also try to purchase vegetables and fruits at the local farmer's market. There are many in Los Angeles County, one that is only about 2 miles away from where I live. The game plan for cooking alot of Algerian dishes is to go to the market and see what's available. High quality ingredients are still only as good as the cook. Common ingredients can be elevated by a very good cook. I know the trend in professional cooking is using the best available ingredients, but if you plan on being a professional you have to know how to cook poor ingredients as well. Otherwise you will be a slave to your ingredients and when they are sub-par you will be too. Algerian cooking is all about depth of flavor. It may comes as a surprise to some, but the cooking in the Sahara and the bled (countryside) of Algeria are more than just meat on sticks. Okay, sometimes it is a whole lamb on a stick for a mechoui. I wrote a little bit about the sort of ingredients we have on our family farm in Setif. It's beyond free range or organic. It is whole, pure food, wild ingredients that speak of the earth and the whims of nature. For those blown away by pre sale lamb from Brittany, a lamb from my family farm in setif that's grazed on the wild greens of the mountains is a whole other experience. Homemade tomato jam was a staple in my Aunt Farida's kitchen. She used it as a base for soups, stews, and dips or to thicken sauces. Homemade tomato jam is unlike any commercially produced tomato paste. The flavor is of intensely concentrated fresh tomatoes with a natural sweetness like tree ripened fruits. It takes a long time to make, but it is not labor intensive if you have a food mill, of course my Aunt Farida did not. The photos below approximate her method. On my family farm in Setif we make olive oil from the fruits of our own trees. We hand pick the olives, remove the leaves and twigs, wash and pat them dry. The olives are then taken to a mill to be crushed in an ancient stone mill. The oil is separated from the paste without the use of heat, it is all natural.. This sort of olive oil is beyond extra-virgin. Dip a little bread into it and you are eating the unctuous soul of the olive itself. I have never seen or heard of anything like it outside of North Africa and the Middle East. My Aunt Farida also brines and cures her own olives. The Zadi farm cooking also uses fresh butter, we make smen too but use it more as a flavoring agent. The butter is freshly churned daily from raw milk resulting in a rich, nutty flavor. This is where we get lben a type of buttermilk.